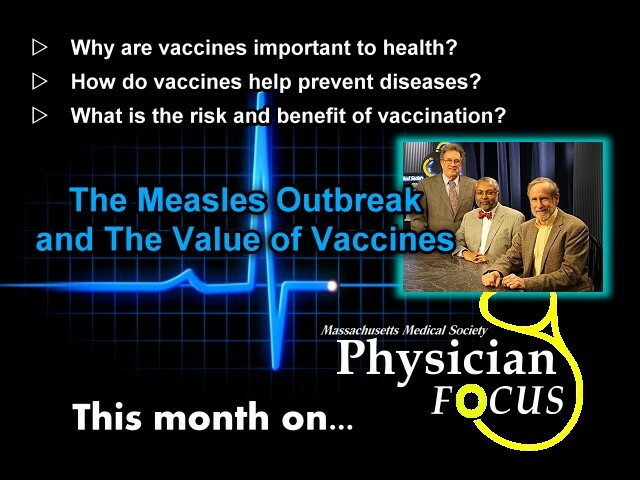 To reinforce public awareness about the benefits of vaccines and immunization, the March episode of Physician Focusexamines the current outbreak and the role of vaccination in personal and public health. Among the topics of discussion are how once-eradicated diseases like measles can return and spread, just how dangerous childhood diseases can be and why people tend to discount their severity, the risks of not getting vaccinated, how herd immunity to protect the public’s health is determined, how misinformation about medicines can spread quickly, how physicians may deal with patients and their parents who have questions or doubts about vaccines, and the importance of immunization for adults as well as children. Bruce Karlin, M.D., Primary Care Physician, Worcester, Mass. ; Utilization Management Medical Director, Saint Vincent Hospital, Worcester, Mass.